Funny how people get excited when they are being talked about. At least Obama is not oblivious to a lot of people that are on this site. He is hitting a little too close to home for some of you. Yeah Doug, here's a "thought". Hold McCain up to anything like the same kind of scrutiny as you are the dems and see how you like him. I have and I don't. Sorry Doug, but if you're looking for a politician of 'modest means'........there is no such animal, and the fact that Obama scares you so, tells me he's definitely on the right track! Read this and decide about our country's direction. BBI, I long to meander on your shores and trails. By the way........the things Obama said about small-town America are true in many places. (red states mostly) Have you ever been to Alabama or West Virginia? (Or a trailer park in Sterling Heights MI?) The truth always hurts the most. His opponents have tried hard to deep-six him because of his so-called elitist comments, but I know he speaks the truth, and so do you. Was it wise for him to say those things? - probably not, but were his comments unjustified? - I think not. We are all bigoted in varying degrees. It's built into our genes. (A distrust of those, not like us.) It has served an important role throughout the evolution of man, from our emergence from the trees, to our tribalistic, nomadic exploration of earth's surface. (Members of rival tribes were always trying to steal your women, your land, or your food.) Carl Sagan has written about this subject in 'Shadows of Our Forgotten Ancestors'. Christopher Wade has covered the subject in his descriptions of ancient ritual and the invention of religion as a possible tool to promote 'trust' within a community. I for one, am glad that Obama recognizes that there are pockets of ignorance in this country, somewhat isolated from the progressive ideas that tend to flourish in and around the larger cities of America. The question is, how do we educate them, and bring them up to speed with the rest of the 'evolving' human race? I have had a "bad" feeling about obama from the beginning. These quotes confirm my intuition. As I've heard, he could be the anti-christ! I hope we are not so fed up with Bush that this is our choice. READ THIS AND WEEP AMERICA. I HOPE WE SURVIVE THIS. WAKE UP AMERICA!! FLAVOR00-NONE-0000-0000-000000000000 ; At least now we know which side his bread is buttered on. It sounds that this guy who wants to be our President is quite a racist!!!! From Dreams of My Father: I ceased to advertise my mother's race at the age of 12 or 13, when I began to suspect that by doing so I was ingratiating myself to whites. From Dreams of My Father : I found a solace in nursing a pervasive sense of grievance and animosity against my mothers race. From Dreams of My Father: There was something about him that made me wary, a little too sure of himself, maybe. And white. From Dreams of My Father: It remained necessary to prove which side you were on, to show your loyalty to the black masses, to strike out and name names. From Dreams of My Father: I never emulate white men and brown men whose fates didn't speak to my own. It was into my father's image, the black man, son of Africa , that I'd packed all the attributes I sought in myself, the attributes of Martin and Malcolm, DuBois and Mandela. From Audacity of Hope: I will stand with the Muslims should the political winds shift in an ugly direction. the antichrist? you have got to be sh**ing me. thats outrageuos and ridiculous. "i forgot my other identity here, so this is the new me,,,im cayla by the way"
Pretty darn scary GonnaGetaway. I too have heard this comment about him "The Anti Christ" This could be the beginning of the end. Like you said, Wake Up Ameica! What are we gonna do? And who is for us-the people? Really for us? Hey sheeple, read about the man I have been speaking of and maybe you would have a clue. Ron Paul is for noone but the people and he is still in the race. Have you written, called, emailed him to run as a thilrd party? Probably not. So don't gripe about Obama, Clinton or McCain. Apathy gets you exactly what you deserve. Sorry, Jeff, Obama isn't gonna help matters. Hillary either. McCain is a disaster. I'm voting for the libertarian whoever it is. I do not support any of these Party Picks. Democrats: Tax and Spend. Republicans: Borrow and Spend. All losers, all turn their back on the constitution. All are for the elites and the rich. None will fight for you after they get your vote. You can put that in the bank....cuz you sure aint gonna put any money in there. Antichrist?! Is this the year 2008?! Lose the superstition people. It will get you absolutely nowhere. On second thought.......antichrist does have a nice ring to it. Sorry right back at ya' John Elmer. Being a realist, I always try to determine the best person I can vote for, without throwing my vote away, which is exactly what you will be doing. A vote for a third-party candidate in the general election, is a vote for McCain and the status quo. Someone needs to let me know how this antichrist thing really works..
First it was Bill Clinton... then by the next election it was John Kerry..now its Barrak Obama. Do they like have a meeting of the anti christ and wear thier devil robes and pass down the 6 ft TAIL and PRONGED FORK to the next Dem. Pres. candidate??? No really please anyone who has any info on how this title is handed down I'm all ears. Until the third party gets a real base under them. Piper is right. No time to vote for another Ralph N. To bad Ron Paul wasnt alittle younger and could run again 4 years from now. Every election they seem to try a different name and face. Its never gonna happen that way. We voted for Ron in the Primaries. dont get me wrong I like his Ideas. The Ron Paul nation needs to try again...next time. Dont waste your vote...it needs to count. According to the latest polls, Hillary's lead over Obama in Pennsylvania has dropped from double to low single digits--and she appears to be losing in Indiana. If this is true, she is toast. I think it will be very interesting to see what percentage of registered Democratic voters in PA and Indiana vote in the primaries and compare it to the percentages that voted in other states earlier in the primary season. If significantly less of them come out in PA and Indiana, it could mean that Hillary's 'landing under fire' statement and Barack's 'guns, god, and bigots" remark could hurt the Dems in the national election. My money is still on Barack to win the Primary and the general election, though. But I think he may be vulnerable in the fall for a number of reasons including the fact that, once it is just John and Barack, voters are going to start learning more about him. What we learn may make us like him more. But I think some of the things he has done (like his very liberal voting record on a whole host of issues), some of the things he and his wife have said, and some of the people he has closely associated himself with, could come back to haunt him. And if there are skeletons in his closet that come out during the general election, more trouble. John McCain is, with all his flaws, a known quantity so it would seem much less likely that we will be surprised by him (but you never know.) People who like, love or hate him now will probably feel the same way come fall. Still, his age, his lukewarm support by conservatives, and the excitement that Barack has created, is gonna make it tough for him. Doug I'm still waiting for you to tell me what part of Rev. Wrights hateful comments arent true....Thier hateful.. but true. Just not in your neighborhood I guess.. There is only one thing I want to say today and that is Obama will NOT get my vote ... Hes been connected to the Muslims .. and that is enough to scare me to dealth !!! All said and done we all are in a pickle that started a long long time ago... now its coming to a head ..
3putt----to learn about the "anti christ", read your Bible and if you do not have one, then borrow one or ask a minister to explain this to you. I been staying out of this for fear of reiterating the obvious. If I jump in, MOVE OVER JEE because my radical 70's old hippie outlook is polished, perfected and based on historical military intervention facts. Anyone up for a philisophical treatise on the true definitation of "sheeples" right/left inclusive of terrorists. All bad evil-doers and un evil-doers end with an "ist" so to be properly tagged then slaughered. I am a pacifist. put me on the hit list. Racist is an IST, too. Now then... Lets update this crap. John Mc Bush allegedly "thinks" we ought to be in Iraq for maybe another hundred years. Ok. He is paying for it? And while we are in town, lets whoop on Iran a tad. Lots is "ists" there, too: Terrorists, Shiite insurgentists, Alqadaists, Jihadists. How to tell the players without a scorecard? 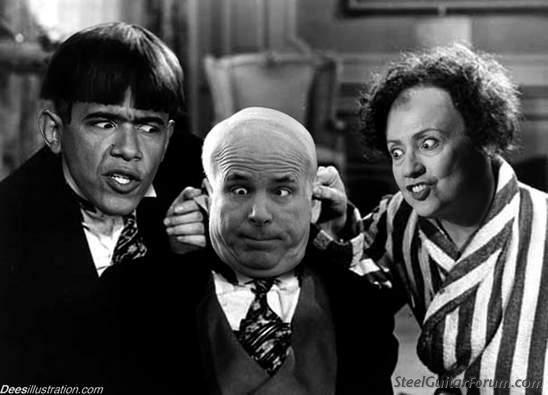 McCain can't discriminate a bunch of evil doer ISTS. They just need to get dialed in to our way way or the highway. All of the ISTS that get in the way. Now Adolf Cheney is playing this like a poker hand. A: Go "surge" into Iran and crash any hopes the Republicans can possibly elected? OR B: go for it and hope to scare the hell out of the sheeples and stay the surge-course? My money is on Plan A. Plan B is WWWIII with hothead McBush pushing the button on command. Now we have "antichrist" clueless biggot lipservice Obama. Talk the talk 101. EGADS! "WHAT A horrible situation" I guess with Billary going down like a sack of dirt, this recent photo will be obsolete. We are all toast here. HOW toasted is the question. Vote? Vote for who-what? Like most elections, this wont come down to voting for an ideal fix-it candidate. We are not voting for who/ideals, we are voting against status quo. This country needs change. Any change. Ok. Do a protest vote: Libertarian, Nader, Ron Paul. Get frustrated, get pissy and get them all told. Why waste your time by voting for a non viable candidate which is the same as not voting, which in an inverse of voting for whomever wins? Called vote stealing. Ross Perot got Clinton elected. Anyone figure out how this works, yet? Don't vote or don't whine. Plug your nose in the poll booth. I am certain the the republicans would LOVE to see R. Paul run as an independant. It really is a horrible situation. My strategy is this: I am going into the voting booth in November and voting against any/ all incumbents. I don't care who they are or what they have done good bad or in between. I am going for gridlock and mass confusion just to turn things upside down and buy some time. I am voting the "gridlock ticket" lacking any sane options. I am employing the crowbar in the spokes voting strategy. If the entire country did this, it would take years for the government to organize well enough to screw things up again. Please see above photo. Those most qualified to lead are least likely to succeed (in politics). The "Peter Principal" if you are familiar with this. "Rise to the level of ultimate incompetence"
I am not speaking for 3putt. I have read the bible and, so sorry, don't buy into all of it. If it were not for organized religion and waging war in "the name of god", then it would be hard to justify war to battle "evil". This applies to both sides here. What about the arab sheeples that flew the airplanes into the trade center as a Jihad wtf ever they call it, doing gods work by "sacrificing" their lives, by taking out American Infidels. Only to be rewarded in heaven for their acts. What a bunch of dumb clueless ****'s. God gave them the high-five for that one, so they were told to get them to do it. The bible is a good book but it sure aint a global one-size-fits-all instruction manual. Nor am I an athiest by absolute defination. I just don't buy ideas that can't be rationalized by logic. God and religion are two seperate things. Posted: Tue Apr 15, 2008 10:18 pm Post subject: Wasting my vote...Not. Jeff, I love that line, "voting for the third party is wasting your vote." Voting for Obama is wasting a vote. Voting for McCain is wasting a vote. Voting for Billary is wasting a vote. If we had this option, "None of the above" I would check that box. As it is, I will in essence vote "None of the Above" by "wasting" my vote on an honest to goodness salt of the earth, regular person, one of us, candidate. We are being offered crap on a plate. And I don't care what cafeteria you are in, crap on a plate is crap on a plate. So, dig into your crap on your democratic or republican plate and enjoy it. And to wash it all down, get to the Tavern as soon as it opens so we can get that nasty taste out of our mouths with some cold ones. Sheeple are invited. Even an "anti-christ" or two. I would love to meet an anti-christ. Wait, isn't Conis an anti-christ? Get a grip. You need to go play outside for a while and give it up with the how bad things are gooogle searches. You are pointing out the obvious to no ones enlightenment, 6 oclock news, same info. wtf else is new today? What is worse the than than a born again new age hippie getting us dialed in? You remind me of Obama. Shut up and go proactive. Lets do a revolution. Its been a slow day. Wait, isn't Conis an anti-christ? Down with the establishment,*#!$ the pigs. I know all the chants. Been there, done that 40 years ago. In the streets with it all. In the street or not, votes will be the bottom line. If you want to make a difference? Do so locally and let it work its way up. Local matters. The president is controlled (in theory) by congress. Ever take gov't 101? Enough for tonight. Get me worked up and then comes the long version... and you don't need that. The problem is that I can type fast. Conis, I am having fun. This stuff is a hoot for me. Its all an interesting act playing out for our entertainment. Protested unconstitutional taxes and wars yesterday at the post office. Fun stuff. Yeah, I need to get outside today too. Too nice of a day to dwell on this stuff. This is pretty simple there is only two people running that have a chance of being president. One is a democrate and the other is a republician, any other vote is just throwing your vote out the window. It is pretty simple who to vote for If you like the way the ecomony and the war is going you vote republician if you want to have a chance for a change vote democrate. Nobody really knows how good any of the canidates are going to be when they get into office. Since the republicians have put us into the biggest debt that we have had. That is one strick against them. Since we have lost more jobs in a 7 yr time, that is another strick against them. Since we are in a war that we can't win and they want to stay that is another strike against them. And this Patroit act that Bush put in I hate it. So that is another strike against them. Wait till you have to get a TRIC CARD I had to this year but you will have to. They only cost 132.50 but all of your information is in there in a micro chip. The america people have to get this card so we don't cause another 911. I still don't know why we have to get it and not any imagrent. Has anyone ever seen the Flinstones episode when Fred and Barney went to the water baffalo meeting with thier big furry hats with the horns sticking out of them and Fred was voted in as the head water baffalo?? This came to me by email , Says it better than I can.. He's not talking just about George Bush. It's time to vote them all out. That includes Hillary and Barack and John and Nancy and Harry. "Am I the only guy in this country who's fed up with what's happening? Where the hell is our outrage? We should be screaming bloody murder. We've got a gang of clueless bozos steering our ship of state right over a cliff, we've got corporate gangsters stealing us blind, and we can't even clean up after a hurricane much less build a hybrid car. But instead of getting mad, everyone sits around and nods their heads when the politicians say, "Stay the course"
Stay the course? You've got to be kidding. This is America , not the *darn* "Titanic". I'll give you a sound bite: "Throw all the bums out!" The most famous business leaders are not the innovators but the guys in handcuffs. While we're fiddling in Iraq , the Middle East is burning and nobody seems to know what to do. And the press is waving 'pom -poms' instead of asking hard questions. That's not the promise of the " America " my parents and yours traveled across the ocean for. Leaders are made, not born.. Leadership is forged in times of crisis. It's easy to sit there with your feet up on the desk and talk theory. Or send someone else's kids off to war when you've never seen a battlefield yourself. It's another thing to lead when your world comes tumbling down. On September 11, 2001, we needed a strong leader more than any other time in our history. We needed a steady hand to guide us out of the ashes. A hell of a mess. So here's where we stand. We're immersed in a bloody war with no plan for winning and no plan for leaving. We're running the biggest deficit in the history of the country. We're losing the manufacturing edge to Asia , while our once-great companies are getting slaughtered by health care costs. Gas prices are skyrocketing, and nobody in power has a coherent energy policy. Our schools are in trouble. Our borders are like sieves. The middle class is being squeezed every which way. These are times that cry out for leadership. When you look around, you've got to ask: "Where have all the leaders gone?" Where are the curious, creative communicators? Where are the people of character, courage, conviction, omnipotence, and common sense? I may be a sucker for alliteration, but I think you get the point. I have news for the gang in Congress. We didn't elect you to sit on your asses and do nothing and remain silent while our democracy is being hijacked and our greatness is being replaced with mediocrity. What is everybody so afraid of? That some bonehead on Fox News will call them a name? Give me a break. Why don't you guys show some spine for a change? Had enough? Hey, I'm not trying to be the voice of gloom and doom here. I'm trying to light a fire. I'm speaking out because I have hope I believe in America .. In my lifetime I've had the privilege of living through some of America 's greatest moments. I've also experienced some of our worst crises: the "Great Depression", "World War II", the "Korean War", the "Kennedy Assassination", the "Vietnam War", the 1970s oil crisis, and the struggles of recent years culminating with 9/11. If I've learned one thing, it's this: "You don't get anywhere by standing on the sidelines waiting for somebody else to take action. Whether it's building a better car or building a better future for our children, we all have a role to play. That's the challenge I'm raising in this book. It's a call to "Action" for people who, like me, believe in America . It's not too late, but it's getting pretty close. So let's shake off the crap and go to work. Let's tell 'em all we've had "enough." Make a "real contribution" by sending this to everyone you know and care about......our future is at stake!